Back in February, Porsche announced the development of three pure-electric prototypes based on the Porsche Boxster roadster, but aside from a single photo and the fact that the electric motors could produce up to 180kW/241HP, the Stuttgart-based automaker did not release any other details on the cars. 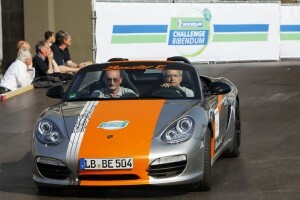 After the demonstration of the Porsche Boxster E, the company decided to share more information on the test cars that are being used as part of the government-funded “Model Region Electro-Mobility Stuttgart” large-scale trial to study the everyday practicality of all-electric vehicles. 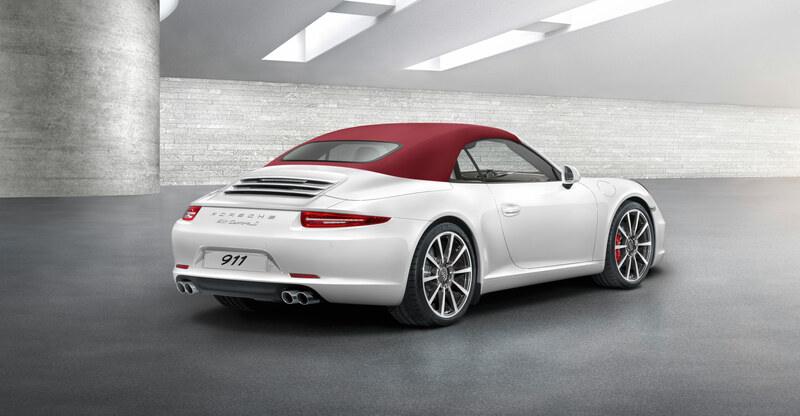 Of the three Boxster E prototypes, two are rear-wheel drive and one is all-wheel drive. 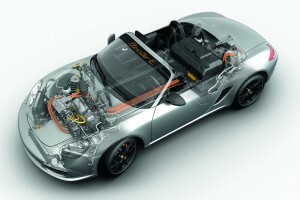 The rear drive unit includes the motor and transmission, together with the power electronics and is located where the manual gearbox and exhaust system are accommodated in the conventional Boxster, while the front electric motor takes up the space freed up by the gasoline model’s 64-liter fuel tank. An electric unit synchronizes the two electric motors and controls the drive torque distribution to the front and rear axle. The two rear-wheel drive models of Porsche’s prototype simply discard the electric motor located on the front axle and make do with the rear unit that delivers 90 kW / 121HP and 270 Nm / 199 lb-ft of torque. The RWD Boxster E can dash from a standing start to 100 km/h (62 mph) in 9.8 seconds, and has a top speed of 150 km/h (93 mph). All Boxster E prototypes are equipped with a 29 kWh lithium-iron-phosphate based battery, which takes up the space of the combustion engine and offers a driving range of around 107 kilometers / 107 miles. The battery weighs in at 341kg / 752 pounds with the Boxster E tipping the scales at 1,600 kg / 3,527 pounds. The battery can be fully recharged through a conventional socket in approximately 9 hours; however, the charging time can be reduced with a rapid charging function. According to Porsche, despite the electronic components, there’s enough space left for a luggage in the front storage compartment while the rear luggage area of the Boxster E remains unchanged. In addition, both the rear- and four-wheel drive Boxster Es are equipped with an Active Sound Design system to provide drivers with acoustic feedback as well as to alert pedestrians and other road users of the car.